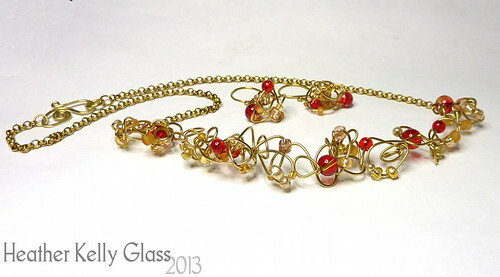 Mum plays the clarsach, so I wanted to make a clarsach focal for her Christmas necklace. It took a few goes to get something I was happy with. I got the bottom of the harp too hot and the stringer fuzzed out. More light grey and hades, this time with white strings. It didn’t work well – the white’s so soft that it balled up too fast on the surface. Rather messy result. This one nearly made it. 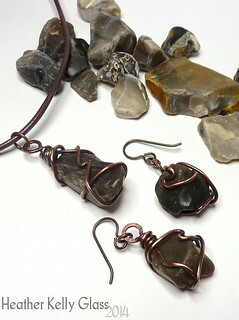 I really like the harp shape – I used a twistie with various browns and neutrals in it. Hades for the strings and for the notes on the back. 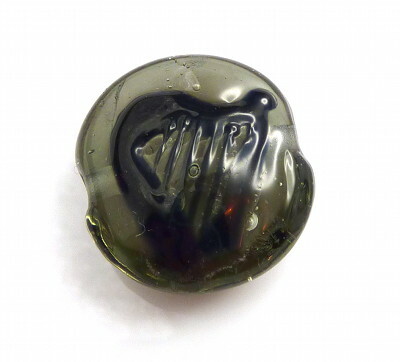 I used CiM chalcedony for the base colour, and I didn’t use this bead because I wanted something more transparent. I think you can keep chalcedony a little more translucent if you’re careful, but certain opalinos opacify on me unless I remember to put them near the front of the kiln (a lot easier when I was batch annealing!). Kryptonite does it too. Showing the notes on the back. In the end I made these beads up into quick pendants by putting them on headpins and gave them to mum too, because she wanted to keep them. 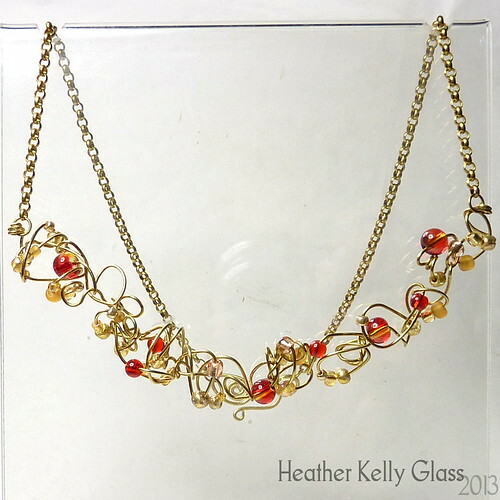 Here’s the final necklace. 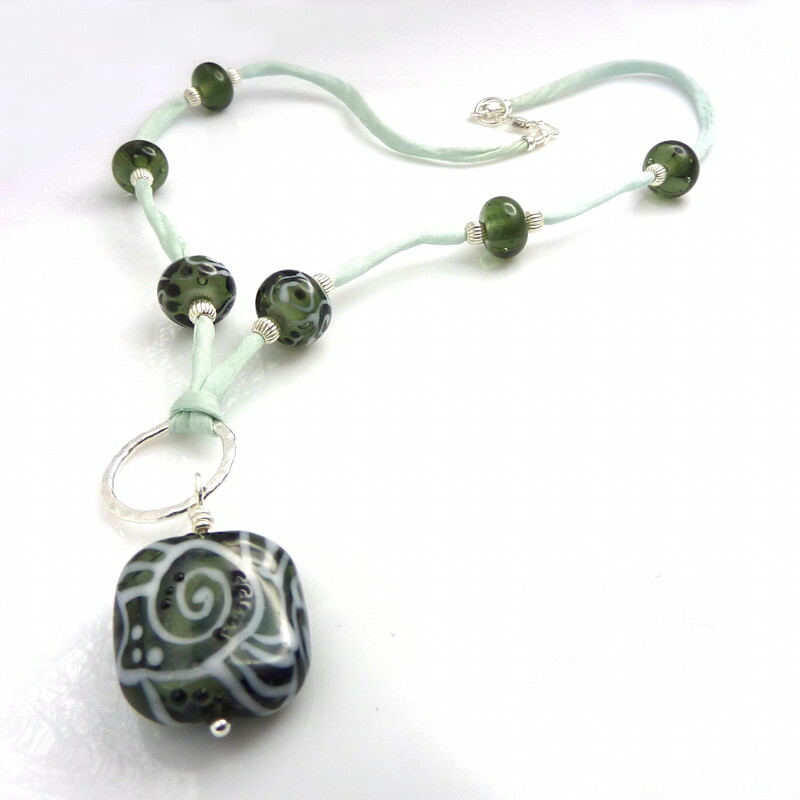 I used CiM peacock green – utterly beautiful colour, and one that doesn’t opacify in my kiln. I kept the harp simple and more stylised – too many strings just messes up the look. There are some musical notes around the harp. 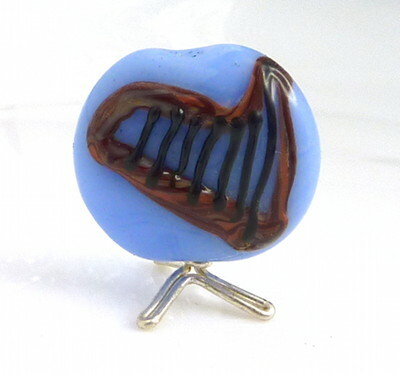 I used another of Diane’s silk ribbons, a hammered silver ring, large Greek silvered ceramic beads, sterling findings and a sterling swan neck clasp to finish it off. Psst, I do like WordPress’s ability to schedule posts. It lets me space them out rather than do two or three on the days I have time to write them. I only noticed it recently! 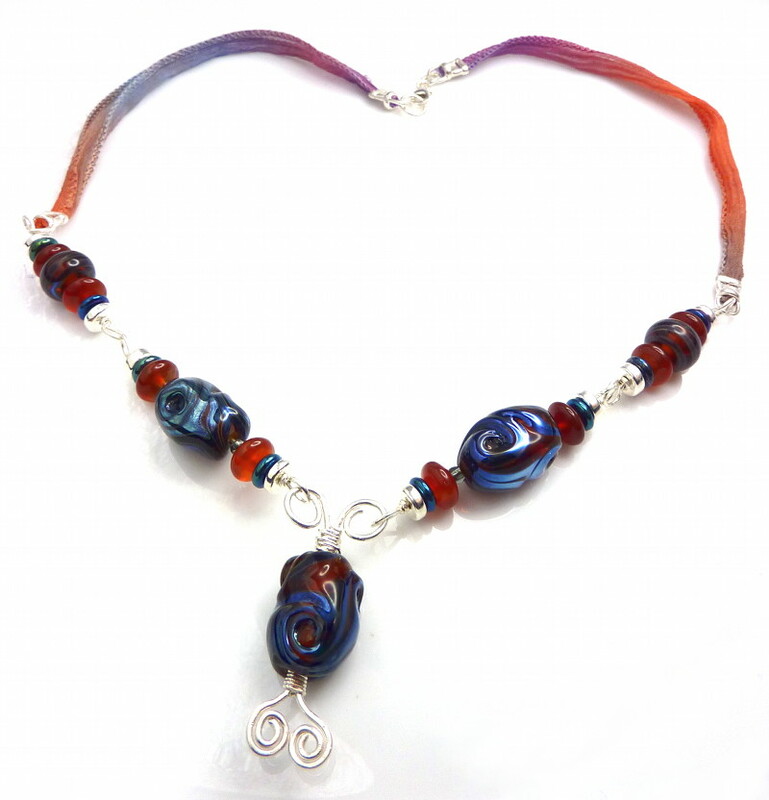 This is a necklace I made as a Christmas present for my boyfriend’s sister Carys. 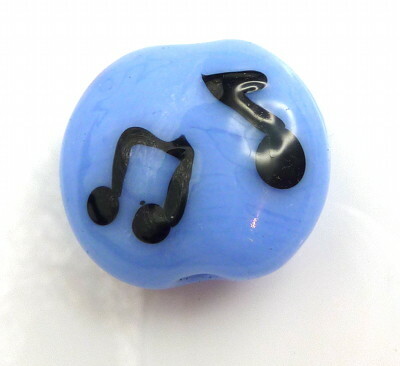 The lampwork beads are transparent mid blue, and the lentil focal has white stringer scrolls. 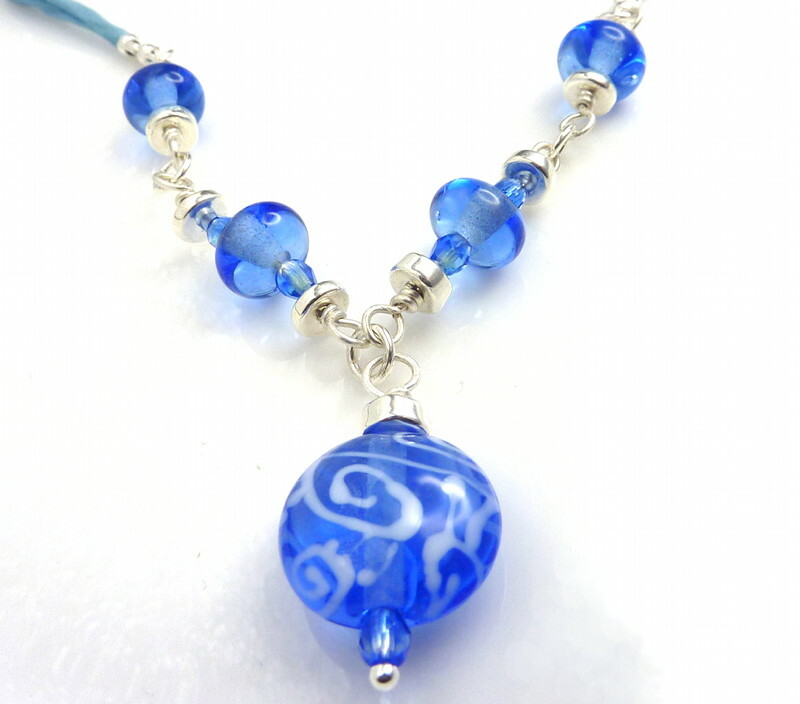 I also used small blue-clear Czech crystals, Greek silvered ceramic spacers and blue silver-lined seed beads. 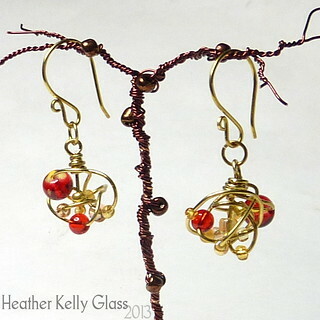 With sterling silver findings and one of Diane’s silk strings. I kept it simple and I think it worked really well. This is where I was going with my dark steel grey muddling. The next lot of beads I tried used white for the core. If I’d been thinking clearly I would have done that first! They have various layers of scrollwork in hades, tuxedo and white. I made a kalera with an effect I rather liked by doing tuxedo scrollwork on the white, then encasing it in dark steel grey, then white scrolls and hades dots on the surface. Having tuxedo inside like that essentially gives you dark shadowy grey scrolls under the surface, since tuxedo is less dense than hades and not purple like Effetre black. (The thicker your encasing, the less noticeable it will be under the dark steel grey though). For my FHF Secret Santa gift I made this necklace. 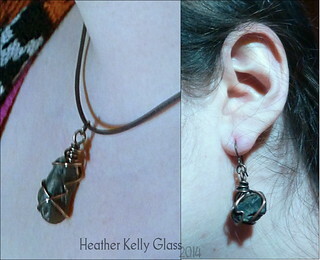 It has a kalera like the one mentioned above, plus some spacers to go with it. I strung it on one of Diane’s silk strings (SowZerE) and paired it with small sterling silver beads and findings, plus a hammered ring. 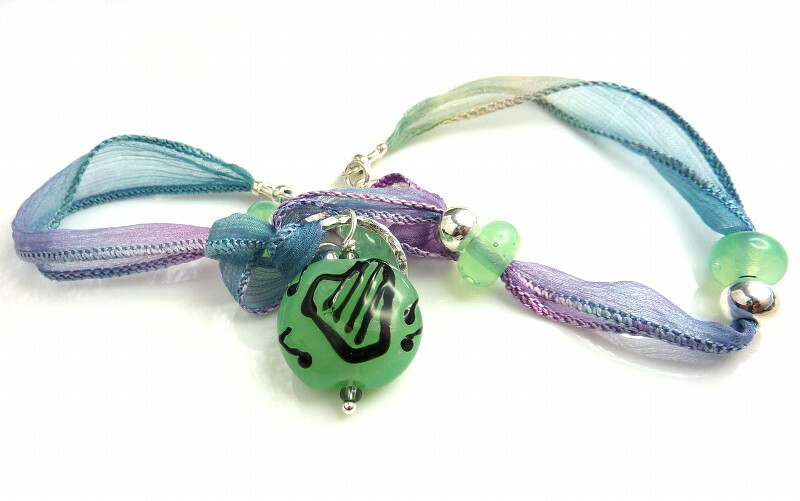 The sterling beads are tight enough on the silk string that they can be used to space everything out without any knots. 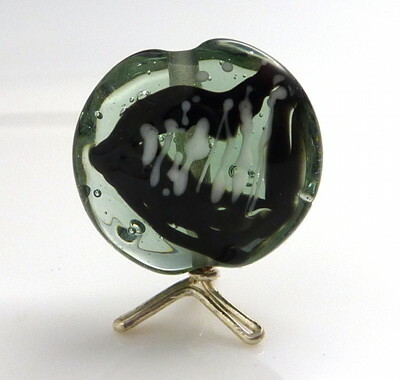 Transparent dark turquoise hollow with white stringer. 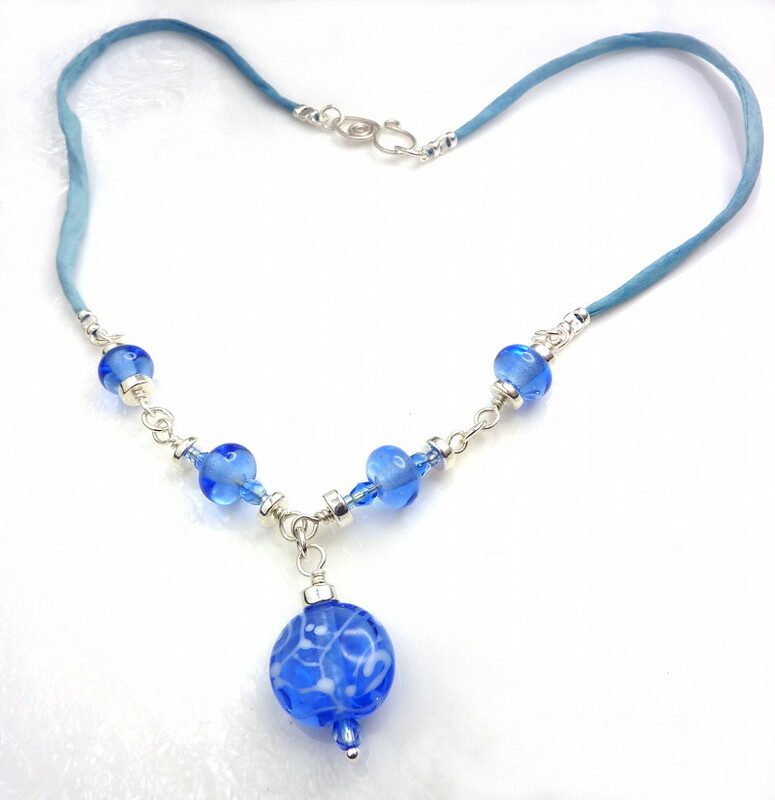 It has Greek silvered ceramic curved beads and a couple of small clear triangular seed beads. I should mention that I love silvered ceramic. 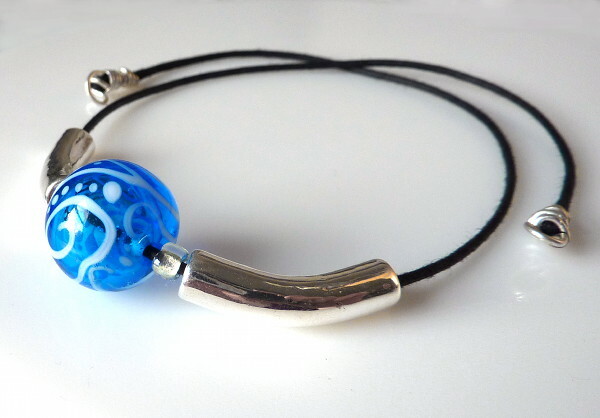 It lets you get substantial silvery beads that are affordable and easy to wear, while being much more durable than silver plate. 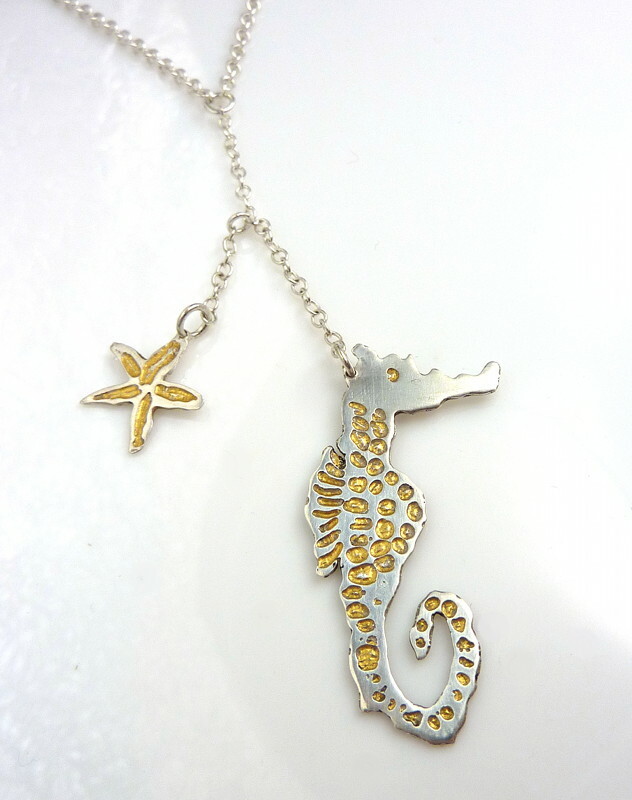 You don’t have to worry about what metals it’s made up of either – the coating is fine silver. 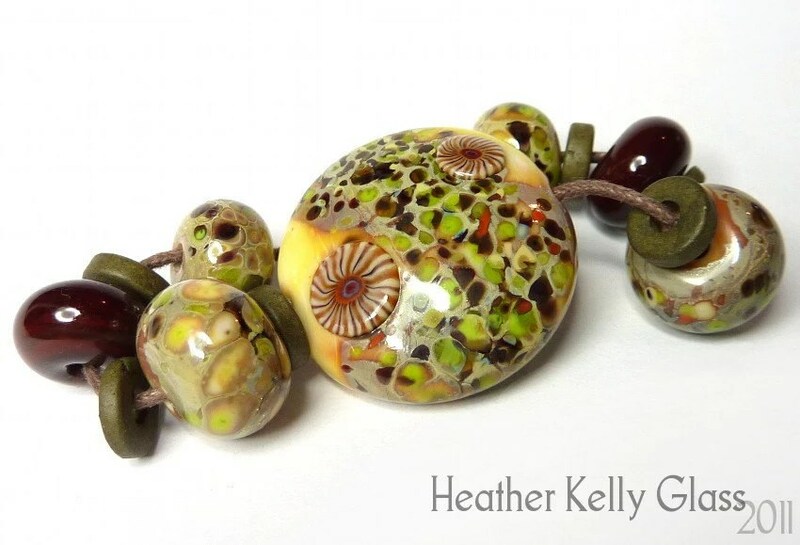 Because the beads are ceramic, the irregularities you get are very different from those in a solid metal bead (casting lines in mass-produced beads for example), and I like that. I think they suit lampwork well. The necklace as shown here is a prototype and needs changing a bit because it is very front-heavy and the clasp has a tendency to slide around. (I used the same swan neck hook that’s on my pumpkin necklace, which is why it isn’t in this photo). 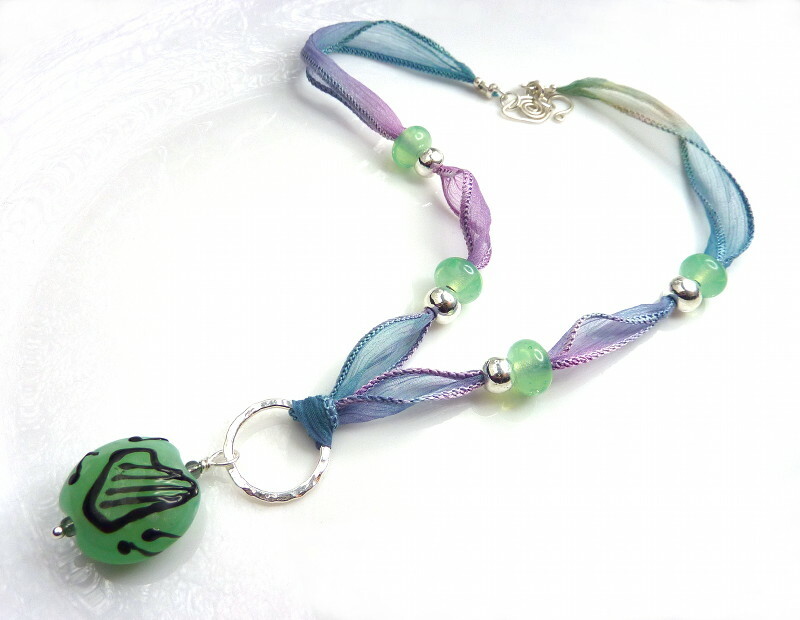 That’s another reason I like knots, because they keep the beads spaced out and in the same position on the string, so the necklace doesn’t rotate. 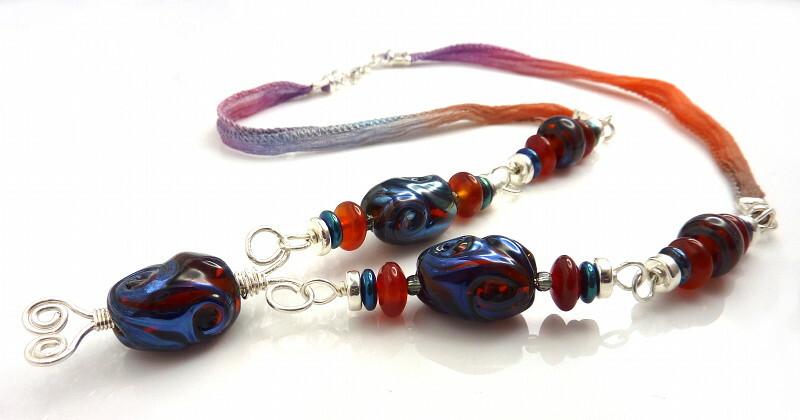 I always get myself into confusions when trying to string necklaces like this – I like my lampwork on chunkier cords, but I also want to be able to use small accent beads, which of course have very small holes! The cord here is 1.5mm waxed cotton and is thin enough for a variety of things to fit on it, but for this necklace I think something more substantial was required because the weight in one place makes it hang in far too narrow a curve. Redo from start, I think.